The Tartan Warriors is a great part of the Aberdeen Highland Games, where athletes compete in a traditional Celtic strongman competition. 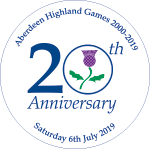 There is tremendous strength and determination on display when the athletes compete in three traditional events; Stones, Sheaf and Caber Toss. Clach Cuid Fir (Gaelic for Manhood Stone) is a traditional test of pure strength. The athletes compete against the clock to determine who can lift five stones of increasing weights off the ground and onto barrels. With the stones weighing between 100 and 165kg this is not an event for the average person, but it is great to watch. This traditional Scottish agricultural sport involves using a pitchfork to hurl a burlap bag stuffed with straw over a horizontal bar above the competitor’s head. The bag typical weights about 7kg and athletes are given three chances to get it cleanly over the bar, without touching it. The winner is the athlete who can successfully clear the highest bar. This traditional Scottish athletic event is said to have developed from the need to toss logs across narrow chasms to cross them. Using a large wooden pole, called a caber the object is not the sheer distance of the throw, but rather to have the caber fall directly away from the thrower after landing. A perfect throw ends with the ‘top’ end nearest to the thrower and the ‘bottom’ end pointing exactly away. This is an impressive feat when the caber is typically 5.94m long and weighs 79kg.